Mr Thomas Hobbes told me, that this Mr Cavendish told him, that the Greeks doe sing their Greeke. I call on him to explain everything as clearly as if it were in Latin. Do you speak mathematics? is a very valid question assuming mathematics is a language. Many think it is. Josiah Willard Gibbs gave a speech on that account. Galileo and R. Feynman thought so. Mathematics is even judged to be a universal language, the only one suitable to initiate extraterrestrial communication [Jacobs, p. 1]. For some people, mathematics is just the language of the quantitative. This opinion is shared by some of our fellow scientists. ... We mathematicians know how wrong this opinion is, and how much effort goes into building concepts, making new links, establishing facts, and following avenues we once thought plausible but turned out to be dead ends. I generally accept the above sentiment with reservations concerning mathematics being just the language of quantitative. I believe the author's objection applies to a more general perception of mathematics as a language. Mathematics is a peculiar human enterprise inextricably intertwined with the development and utilization of a language - the language of mathematics. The relationship is not unlike that between, say, English literature and English language, or French literature and French language. Expanding the analogy, I think it is reasonable to think of mathematics as a literary endeavor based on the mathematical language. However, the relationship between mathematics and its language is stronger than that between other kinds of literature and the underlying language. One manifestation of that bond between mathematics and its language is the difficulty, even impossibility, of translation of mathematics into other languages. Hard as it may be to translate from English into French or Japanese into English, good translations exist. Not so with mathematics. There are of course good popularizations that undertake to translate mathematics into more common languages, but there's always a limitation on how far one may go. Some things could only be expressed in the compact language of mathematics. My own attitude, which I share with many of my colleagues, is simply that mathematics is a language ... in which anyone, whether expert or non-expert, may attempt to communicate. Below I describe an example that, in my view, shows the mathematical language at its best. As usual, I tried to prepare a Java applet that illustrates the concepts involved. I am not at all sure that, in this case, the effort paid off. The notations I shall introduce shortly make a wonderful job of keeping all the concepts handy. At the age of sixteen B. Pascal proved a remarkable theorem: The three intersections of the pairs of opposite sides of a hexagon inscribed in a conic are collinear. It is said [Bell, p. 78] that from that result (and two other lemmas) Pascal derived all Apollonius' theorems on conics and more, no fewer than 400 propositions in all. Little wonder he called it the Mystic Hexagram (Hexagrammum Mysticum). The original manuscript (that was lost) was examined and praised by Leibniz. Descartes was stunned to learn that the work had been performed by a sixteen years old. A shorter version written a year later has survived, see [Source, p. 326-330], but contains no derivation. The theorem is clearly of projective nature, and in the surviving manuscript Pascal leaves no doubt of his intention to imitate the methods of Projective Geometry that Desargues introduced a short time beforehand. In the 17th century, identification with Desargues' work was certainly detrimental to any discovery. The ridicule with which his concepts and notations were met caused Desargues to give up on mathematical research. Projective Geometry lay abandoned for about two hundred years; and Pascal's result had shared its fate. However, in the 19th century it was rediscovered with vengeance. The configuration has proved to have a rich, if not mystical, structure with numerous coincidences and collinearities that Sylvester called "cat's cradle." 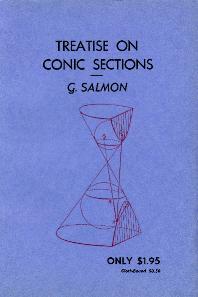 The following is a paraphrase of a part of the Notes at the end of the classical Treatise on Conic Sections by G. Salmon. I found the treatment fascinating. A judicious choice of notations appears to magically deliver a sequence of results "just by looking." It is obvious however that the notations alone do not do the trick; they just help make an efficient use of the concepts they represent. The six vertices are cumulatively called P-points. The P-points are being joined by 15 C-lines. Each of the C-lines is crossed (even if at infinity) by 14 other C-lines. Some cross at the P-points, others elsewhere. Those intersections that do not necessarily coincide with any of the P-points, are called p-points. Out of 14 cross points on a C-line, 8 (4 at each of the defining P-points) are P-points, the remaining 6 are p-points; there are 6 p-points on every C-line. The total number of p-points therefore is 6·15/2 = 45. Each of the p-points lies on four Pascals. Indeed, ab·de lies on abcdef, abfdec, abcedf, and abfedc. Each Pascal carries 3 p-points. The total number of Pascals therefore is 45·4/3 = 60, which of course might have been established more directly as, say, the number of Hamilton cycles on a 6-graph. This is Steiner's theorem: Pascals intersect three at a time at what we'll call g-points. In the above notation for a g-point, each vertex appears only once in every row and every column. So that the notation clearly indicates that there are exactly three Pascals incident to that point. We conclude that there are 20 g-points. The first two share the point ce·bf. This is one of the vertices of the triangle. The other two vertices are similarly found to be bd·ae and df·ac. The triangles (1) and (3) therefore are perspective from a line. By the converse of Desargues' Theorem, the triangles are also perspective from a point: the lines joining their corresponding vertices meet in a point. There are 60 Kirkman h-points in all, three per Pascal. (The applet below purports to illustrate the results we have derived so far. At the bottom left of the applet, there is a modifiable permutation of the vertices of the hexagon. Individual letters could be changed lexicographically up or down by clicking a little off their central line. Whatever you do, the string is programmed to present a valid permutation of the vertices. As a consequence, getting the desired permutation is a puzzle in its own right. But once you got the desired ordering of the vertices, click the "Push Pascal" button to have the corresponding Pascal displayed. You may also check the boxes "g-points", "h-points", and "p-points on Pascals" to see those points on the selected Pascals. After "pushing" one Pascal, it is possible to modify the permutation and "push" another one. Two Pascals will be drawn, and more, if you continue the process. Two checkboxes, "p-points on C-lines" and "Pascals through p-point", behave differently from the rest. If, say, the first is checked, then after you click on a C-line, the C-line will be "pushed" for special treatment: it will be shown together with its six p-point companions. If you click on a p-point while the "Pascals through p-point" is checked, the point will be "pushed" for a special treatment such that you'll see the four Pascals that meet at that point. The story does not end here. However, by the time I reached the point reflected by the current functionality of the applet, my enthusiasm for programming Java illustrations began to wear out. The mathematical language seemed so much clearer than whatever I managed to do with Java. So, to wrap up this column let me just mention a few additional results from the book [Salmon, p. 381]. Cayley and Salmon have independently showed that, in addition to the above, there are 20 G-lines each carrying 3 h-points and 1 g-point. Also, the 20 G-lines pass four at a time through fifteen i-points. Finally, another Steiner's theorem claims the existence of fifteen straight lines I with four g-points on each. Hesse has noticed that there is a certain reciprocity between the theorems we have obtained. There are 60 Kirkman points h, and 60 Pascal lines H corresponding each to each in a definite order to be explained presently. There are 20 Steiner points g, through each of which passes three Pascals H and one line G; and there are 20 lines G, on each of which lie three Kirkman points h and one Steiner g. And as the twenty lines G pass four by four through fifteen points i, so the twenty points g lie four by four on fifteen lines I. According to Wells and Honsberger, the nomenclature is as follows. The 20 G-lines are known as the Cayley lines. The fifteen I-lines are Plücker's, the fifteen i-points are Salmon's. The pleasure of course is his who speaks mathematics.